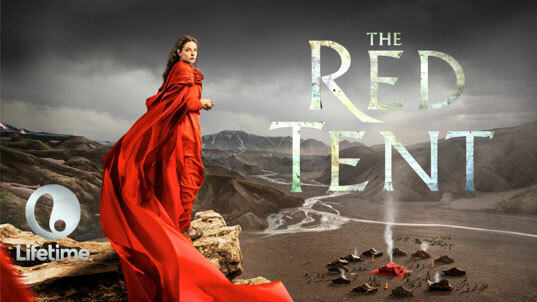 Lifetime/Sony’s The Red Tent takes Anita Diamant’s 1997 New York Times Bestseller and adapts it into a two-part, three-hour miniseries about the wives of Jacob from the Old Testament in the Bible. Starring a strong cast that includes Minnie Driver, Iain Glen, Morena Baccarin, Debra Winger, Rebecca Ferguson, and Will Tudor, the film focuses on the under-appreciated character of Jacob’s only daughter, Dinah, from Genesis 34. It’s all about the survival of women in a patriarchal society intended to control and limit them, but does it really jive with the Biblical narrative? But in a cinematic landscape where atheists Darren Aronofsky and Ridley Scott can deliver Noah and Exodus, respectively, what can we make of The Red Tent? Using the Jacob/Esau storyline as an example, we can see that the actual confrontation could’ve played out that way, that specifically, that intense. But what of Jacob’s wrestling with the angel? Taking Diamant’s Jewish background into consideration, the wrestling was still true to the Jewish narrative, and the divinity of the moment has been stripped down and bared. [Now, it may or may not be true to the book, I don’t know.] But forgiveness is important to the moment that director Roger Young (Barabbas, Jesus) does bring across, even if he ignores the divine. This entry was posted in Books, Reviews, Theology, TV and tagged Bilhah, Debra Winger, Dinah, Iain Glen, Leah, Minnie Driver, Morena Baccarin, Rachel, Rebecca Ferguson, Will Tudor, Zilpah. Bookmark the permalink.